Walking into Public on Franklin Street on any given morning in Adelaide – rain, hail, or sunshine – always brings a huge smile to my face. When you’re welcomed by some of the friendliest staff members and are treated to an exceptional customer service and yummy bites of food and decadent coffee, you know you’re in for a treat! Open bright and early at 7am from Monday-Friday, Public in the heart of Adelaide CBD is ready to cater to your morning needs by preparing a nice, hot cup of caffeine-filled goodness and a hearty brekkie meal – be it sweet or savoury – so you can’t really go wrong with this place. The team at Adelaide Food Central was invited back to trial their new waffle dishes, where all food and drink was provided free of charge. Public’s Executive Chef Shane Piercy has done it again, by presenting two waffle dishes that are not only pleasing to look at, but also bring a high quality of sweetness and/or savoury-filled deliciousness (depending on your choice of meal). As most dishes that are served here, both waffle dishes possess a simplistic yet unique combination of ingredients that make them enjoyable, especially to one with a hungry and grumbly belly! 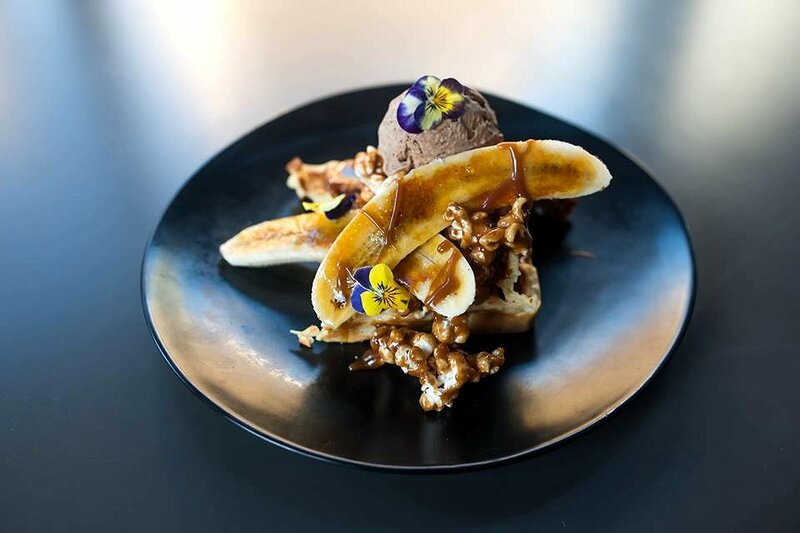 The Sweet Waffles had caramelized bananas, cinnamon ice cream, and popcorn with a drizzle of salted caramel sauce and topped with edible flowers. Also available as a dessert dish during lunch, the waffles presented with a burst of different and complementary flavours. The softness of the banana, coupled with the crunchiness of the crispy caramel layer on top of it presented with a subtle sweetness. The crunchiness of the popcorn worked well with the smooth scoop of cinnamon ice cream. While this is a dish that may be overpoweringly sugar-induced for some, it is most certainly one that everyone with a sweet tooth will enjoy, even if it’s in small bites and as a share plate between two-three people. 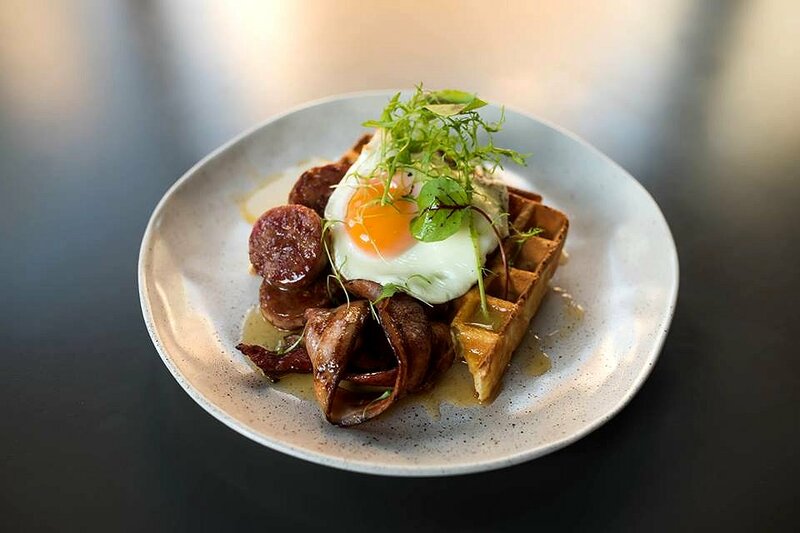 The Savoury Waffles were another wholesome dish that came with Cotechino sausage spheres, Hamlet’s Willunga bacon, fried egg, and maple butter. This was another great meal, which had an appetizing contrast of sweet and savoury. The fried egg was perfectly cooked sunny side up, with a crispy outer layer and a soft centre with the yolk. The sausages had a very pleasing symmetry to it and were cooked well with a tender meaty texture. Being a bacon lover, I enjoyed having some seriously crispy bacon that was drizzled in just the right amount of maple butter. All in all, a winning breakfast meal that delivered all the goods! Whether you work in the Adelaide CBD or happen to stop by our lovely city centre to catch up with friends and/or family, make sure you make some time to check out and dine at Public. For $17, the waffles are certainly worth the price and you get a generous portion of the meal that will leave your starving belly satisfied!